Some sly wit has put a purity ring (used) up for sale on Ebay. All proceeds go to Planned Parenthood of Los Angeles. A++ troll; two thumbs up. 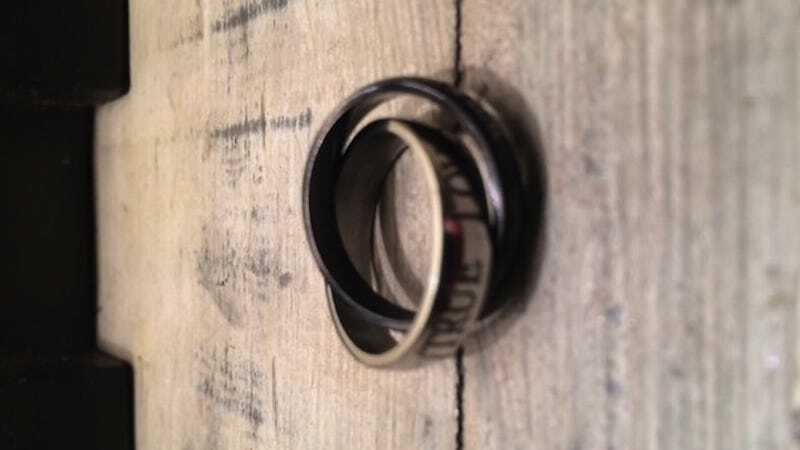 "This purity ring has a double-band and is etched with True Love Will Wait. It's gently used and looks like new. This isn't weird. Really," promises the product listing. "It's just that ... how should I say this? ... the ring is no longer needed." "What do I have in common with Miley Cyrus, Selena Gomez, and Nick Jonas? They don't wear their purity rings anymore, and neither do I," the description adds, promising the ring will bring good luck. Currently, the bidding has reached $76. It is worth noting that—according to this blog, at least—the ring was acquired for "research purposes," not by sitting through some excruciating True Love Waits program in a dank church basement. Which makes you wonder: What does happen to discarded purity rings? Judging by these other listings, Ebay is not an uncommon fate.